1 - A big axe-guitar....NO, a big, BLOODY axe-guitar! See Chewie's thread for good bloody axe ideas. A - Take a Dannl Faytonni head, shave back the hairline and give him a perm. 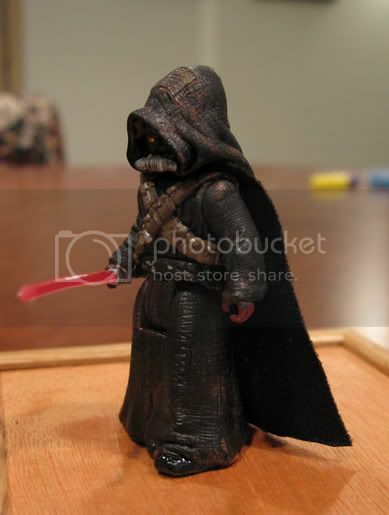 Attach said head to a skirtless ROTS Padme body. Adorn Padme with red and white striped Daisy Dukes, revealing white tanktop, white workout Keds and white calf-length socks. Paint the legs, upper torso and arms hairysunburneddoughy #5, and VOILA! Gene Simmons with his faithful sidekick and little brother, Richard! I can't wait to see your Lickin' to the Oldies photonovel! Thanks for all the comments. I really like the way Roronn turned out. I was surprised how easily those parts fit together. I may put a soft goods cloak on him to see how he looks. The wolfman was one of my first intensive part swaps custom. I'm still not sure the parts fit together great but overall I'm happy with him. The KISS custom was a fun little custom. I hadn't thought about a sidekick per se. I'm working on the other band members now too (at least mentally I am). I'm not sure if I'll actually keep them when I'm finished as I'm not exactly a KISS fan. However, the Mas Amedda tongue inspired me to try it out. Great collection of figures mate you've done a greatjob on everyone of them . I finished up the KISS band tonight. I just couldn't leave Gene Simmeddas hanging by himself. Hey, that actually looks like Space Ace!! BTW, damn I could used that Orn as a prisoner. oh, man! that is so cool! thats very cool brentS. very clever. 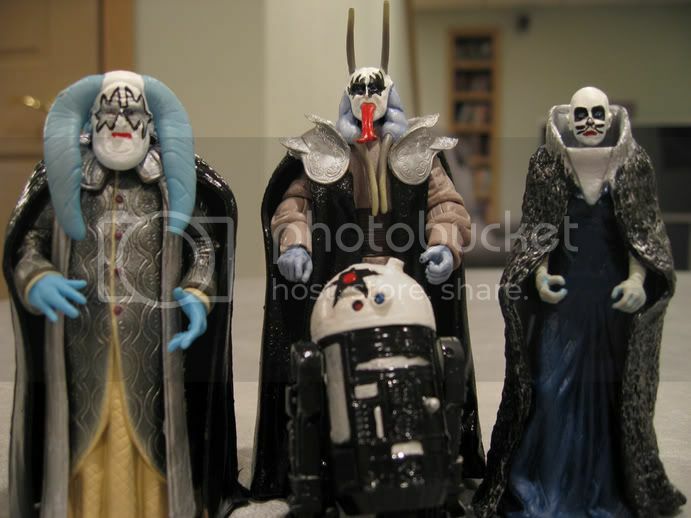 These are the funniest customs that I have seen in a long time! You really went all out with these figures, the paint detailing looks top notch. Well, I've got a vacation day tomorrow so I stayed up late tonight to finish up one custom and start another. I finished up the Sith Jawa. I took some advice for the WIP and added some "technology" to the face mask. I also added a small custom soft goods cape. I repainted the face and added some silver drybrushing. 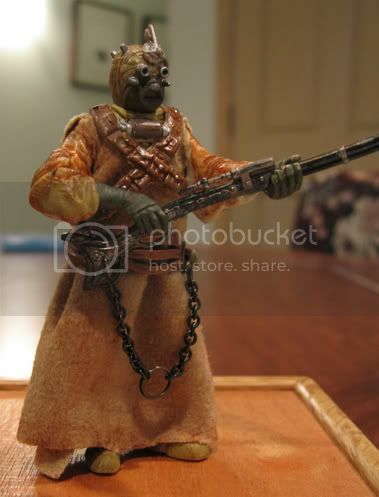 As some of you are aware, I've been trading for a number of Tusken raiders recently. These are planned for an upcoming project. 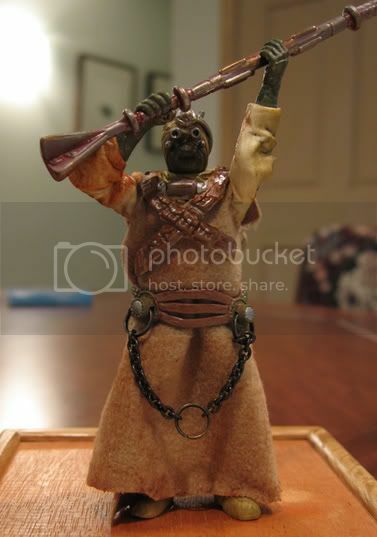 Here is a preview character - a Tusken War Chief (yet to be named). I'm very pleased with how he turned out. Let me know what you think. I'm planning on trying my hand at a Photonovel (or at least a "photonovelette") with both of these characters making some sort of appearance. The Sith Jawa is sweet, Brent. The addition of the cape is what makes it, I think. The Tusken War Chief is going to inspire DOZENS of copycat jobs, man. That is a great concept which you have expertly executed! The only suggestion I would have - and it's not a real big deal - would be to figure out how to make the crossed bandoliers wrap all the way around his body. The use of the harness for a belt is a very nice touch. Can't wait to see how you put these guys in play. Wow Brent you've been busy. I absolutely love the members of Kiss. The Gene Simmons one is perfect. I love Ace too. That sith jawa reminds me of a lego Vader. The breather is a good idea but the cape really makes this sith jawa complete. Nice combination of colors you used on the hood. 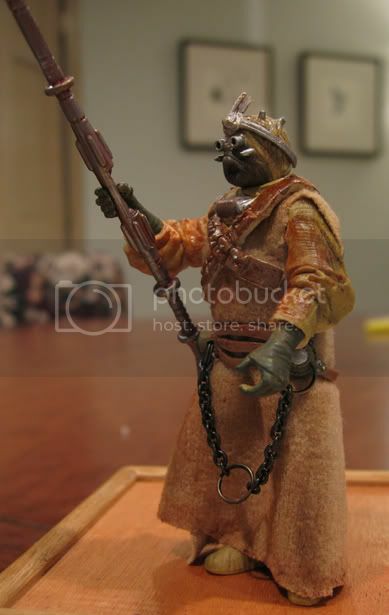 I like the Tusken War Chief. The metal chain and softgoods are a great idea. Its good you didn't add the fabric to the sleves. It would look too bulky that way. I wish the straps when all the way around the figure but that doesn't take away from a great figure. 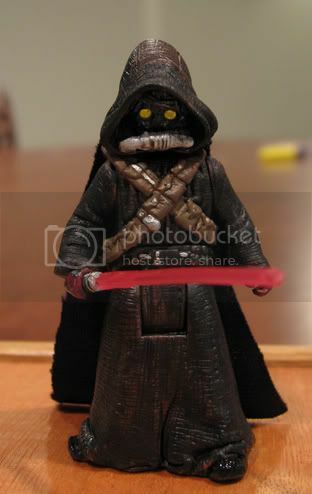 The Sith Jawa to me is a funny, kinda cute little custom. Reminds me of something Disney might do. It's a great custom though, I think the extended cape and the breather on the face are perfect additions. Makes you realize that Jawa's may not always be such little, seemingly harmless creatures. The Tusken - holy cow! Is this one of the ones I sent you? That's a mean looking guy. Cloth goods work better here than I thought they would! Thanks for the comments everyone. I agree about the chest bandoliers. I need to find some way to connect them together. I'll looks through my bits and pieces and see what I can come up with. I may have to resort to some sort of rubber bands. Chewie, yes this is one of the Saga Tuskens I got from you (for the base). I cut the bandoliers from a POTF figure that I got from another trade. The silver "crown" was made from pieces of an Obi-Wan Pilot headpiece. For the Jawa, I think he's funny. I'm envisioning that the breather may actually be a "translater" so that we does just say "Uttini!" I'm off for a few days. I hope that I can provide another update sometime next week. Have a great weekend everyone!! Perhaps a repainted Wookie Warrior bandolier would work? Or a single IG-88 bandolier? You would probably have to tighten up the former, but that's always easier than trying to make something bigger.